In the Ancient Near East, clay tablets (Akkadian ṭuppu(m) 𒁾) were used as a writing medium, especially for writing in cuneiform, throughout the Bronze Age and well into the Iron Age. Cuneiform characters were imprinted on a wet clay tablet with a stylus often made of reed (reed pen). Once written upon, many tablets were dried in the sun or air, remaining fragile. Later, these unfired clay tablets could be soaked in water and recycled into new clean tablets. Other tablets, once written, were fired in hot kilns (or inadvertently, when buildings were burnt down by accident or during conflict) making them hard and durable. Collections of these clay documents made up the very first archives. They were at the root of first libraries. Tens of thousands of written tablets, including many fragments, have been found in the Middle East. In the Minoan/Mycenaean civilizations, surviving writing is mainly that used for accounting. Tablets serving as labels, with the impression of the side of a wicker basket on the back, and tablets showing yearly summaries, suggest a sophisticated accounting system. In this cultural region the tablets were never fired deliberately, as the clay was recycled on an annual basis. However, some of the tablets were "fired" as a result of uncontrolled fires in the buildings where they were stored. The rest are still tablets of unfired clay, and extremely fragile; some modern scholars are investigating the possibility of firing them now, as an aid to preservation. Writing was not as we see it today. In Mesopotamia, writing began as simple counting marks, sometimes alongside a non-arbitrary sign, in the form of a simple image, pressed into clay tokens or less commonly cut into wood, stone or pots. In that way, recorded accounts of amounts of goods involved in a transaction could be made. This convention began when people developed agriculture and settled into permanent communities that were centered on increasingly large and organized trading marketplaces. These marketplaces traded sheep, grain, and bread loaves, recording the transactions with clay tokens. These initially very small clay tokens were continually used all the way from the pre-historic Mesopotamia period, 9000 BCE, to the start of the historic period around 3000 BCE, when the use of writing for recording was widely adopted. The clay tablet was thus being used by scribes to record events happening during their time. Tools that these scribes used were styluses with sharp triangular tips, making it easy to leave markings on the clay; the clay tablets themselves came in a variety of colors such as bone white, chocolate, and charcoal. Pictographs then began to appear on clay tablets around 4000 BCE, and after the later development of Sumerian cuneiform writing, a more sophisticated partial syllabic script evolved that by around 2500 BCE was capable of recording the vernacular, the everyday speech of the common people. Sumerians used what is known as pictograms. Pictograms are symbols that express a pictorial concept, a logogram, as the meaning of the word. Early writing also began in Ancient Egypt using hieroglyphs. Early hieroglyphs and some of the modern Chinese characters are other examples of pictographs. The Sumerians later shifted their writing to Cuneiform, defined as "Wedge writing" in Latin, which added phonetic symbols, syllabograms. Text on clay tablets took the forms of myths, fables, essays, hymns, proverbs, epic poetry, laws, plants, and animals. What these clay tablets allowed was for individuals to record who and what was significant. An example of these great stories was The Story of Gilgamesh. This story would tell of the great flood that destroyed Sumer. Remedies and recipes that would have been unknown were then possible because of the clay tablet. Some of the recipes were stew, which was made with goat, garlic, onions and sour milk. By the end of the 3rd Millennium BCE, (2200-2000 BCE), even the "short story" was first attempted, as independent scribes entered into the philosophical arena, with stories like: The Debate between Bird and Fish, and other topics, (List of Sumerian debates). Communication grew faster as now there was a way to get messages across just like mail. Important and private clay tablets were coated with an extra layer of clay, that no one else would read it. This means of communicating was used for over 3000 years in fifteen different languages. Sumerians, Babylonians and Eblaites all had their own clay tablet libraries. The Tărtăria tablets, the Danubian civilization, may be still older, having been dated by indirect method (bones found near the tablet were carbon dated) to before 4000 BCE, and possibly dating from as long ago as 5500 BCE, but their interpretation remains controversial because the tablets were fired in a furnace and the properties of the carbon changed accordingly. Fragments of tablets containing the Epic of Gilgamesh dating to 1800-1600BCE have been discovered. A full version has been found on tablets dated to the 1st millennium BCE. Tablets on Babylonian astronomical records date back to around 1800BCE. Tablets discussing astronomical records continue through around 75CE. Late Babylonian tablets at the British Museum refer to appearances of Halley's Comet in 164BCE and 87BCE. ^ Black, Jeremy Allen; George, Andrew R.; Postgate, Nicholas (2000). A concise dictionary of Akkadian (2nd ed.). Harrassowitz Verlag. p. 415. ISBN 978-3-447-04264-2. LCCN 00336381. OCLC 44447973. ^ The Cuneiform Digital Library Initiative gives an estimate of 500,000 for the total number of tablets (or fragments) that have been found. ^ a b c "Early Writing". Harry Ransom Center - University of Texas at Austin. Retrieved 9 October 2015. ^ a b "Cuneiform - Ancient History Encyclopedia". Ancient.eu.com. Retrieved 2014-06-16. ^ Kovacs, transl., with an introd. by Maureen Gallery (2004). The epic of Gilgamesh (Nachdr. ed.). Stanford, Calif.: Stanford Univ. Press. pp. xxi–xxii. ISBN 978-0804717113. ^ Thurston, Hugh (1996). Early astronomy (Springer study ed.). New York: Springer. pp. 64–81. ISBN 978-0387948225. ^ Stephenson, F. R.; Yau, K. K. C.; Hunger, H. (April 1985). "Records of Halley's comet on Babylonian tablets". Nature. 314 (6012): 587–592. doi:10.1038/314587a0. ISSN 0028-0836. 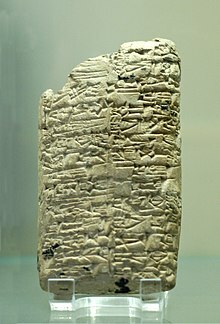 Wikimedia Commons has media related to Clay tablets.